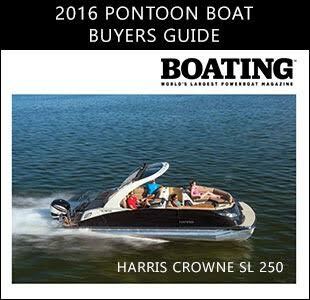 Boating magazine features the Harris Crowne SL 250 in its 2016 Boat Buyers Guide, saying it "boasts an impressive ride and eye-catching styling." With its plush interior and abundant amenities, the Harris Crowne SL 250 is one of 2016's most sought after luxury pontoon boats. Boating calls attention to Harris’ Performance III package in its guide, crediting the 25-inch center tube for the Crowne SL 250's smooth ride. "With the addition of lifting strakes, the package gives the Crowne impressive agility with the inside-lean handling characteristics of a V-hull," the article notes. "Equipped with a Mercury Verado 300 outboard, the Crowne planed in 3.4 seconds, reached 30 mph in 7, and topped out at 47 mph."